Many people have large pantries that they keep stock with various products. There are people who just like to cook. Others like to entertain. Some people prepare food items for the homeless and less fortunate. Some do catering work as a part-time business. In all of these cases, you do not want to be running to the store at the last minute to find the special product or ingredient needed to make something that is good, into an even better dish. The Grocery List Template for Pantry Food can be a very important tool in not only stocking your pantry the first time you use it. It can also be used to make certain that the items you want are always available. 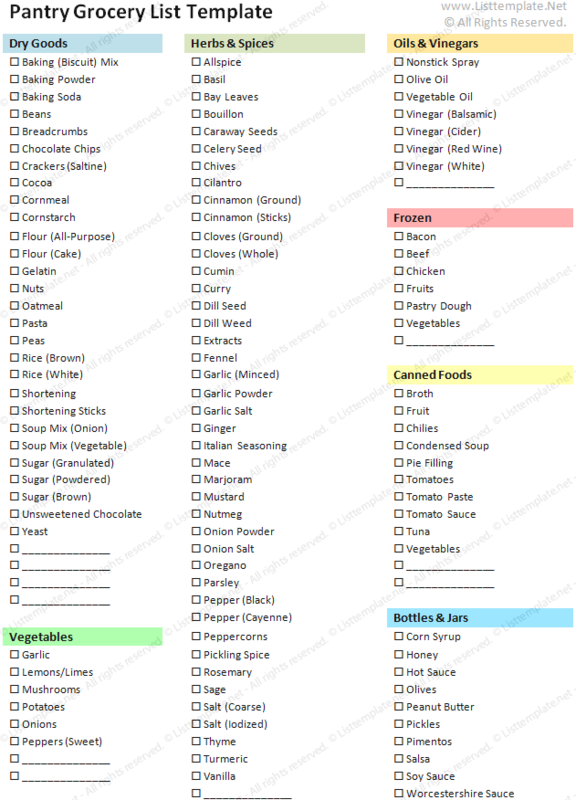 Built on the Microsoft Word® platform, the template is design to check off the items you have in your pantry. You can mark through the items you never use. Then with another copy of the template, you can mark the items that need to be replenished. Since the template is made on the Word platform, it is also possible to personalize the template for your own unique needs. The template establishes several categories and includes items that might be missed on a normal shopping trip. Among the categories are dry goods, herbs and spices; oils and vinegars along with other items. The template is simply a tool that assists in organization and planning, thus avoiding last minute trips to the store or running out of a key ingredient.